Your 3D content on a real volumetric surface, no glasses needed! VVD (Volumetric Visualization Device) is a patent pending solution invented by Lumi Industries, that allows a real three-dimensional visualization of 3D surfaces. VVD becomes an indispensable tool in fields such as design and modeling allowing to view files and verify their measurements and proportions and their correction before they are made with 3D printing or other techniques, making drastic cuts at costs and prototyping times. eliminating the margin of error. Including the visualization of Dicom scans and 3d scanned models from desktop or intraoral scanners or CAD models, and the sharing of the 3D visualization with colleagues to discuss applications or strategies, or with the patient to explain an intervention, or to presenting and discussing "case studies" during conferences and meetings. In this field the high compactness and portability are excellent strength points. VVD applications in the field of education are limitless: a teacher of middle school that wants to introduce math concepts in a more captivating way, the professor of science who wants to explain to students subjects like chemistry and physics showing three-dimensional models of great visual impact. With VVD any architect or interior designer can constantly double check its work-in-progress with a real threedimensional view, limiting the risk of errors. Many people can watch the same 3D model at the same time, allowing more direct discussions and decision-making sessions on the project with your costumers and design team members. VVD can be used for the three-dimensional visualization terrain or geographic surveys using DEM elevation files. A more compact VVD version can be even integrated into the dashboard of any vehicle, for real-time 3D visualization of GPS navigation systems. VVD can be used in museums and exhibitions to highlight particular items, while more information can be provided on the frontal screen. The affordable price (compared to other similar products) and the ability for many different people to observe it from any point of view at the same time, make it a very interesting device to attract visitors. VVD is a stand-alone device that allows people to watch the projected 3d model from all points of view, by an unlimited number of people at the same time, eliminating the need to use expensive special glasses. Moreover, the display screen located on VVD frontal area can be used to add pictures, videos and more information about the visualized object. 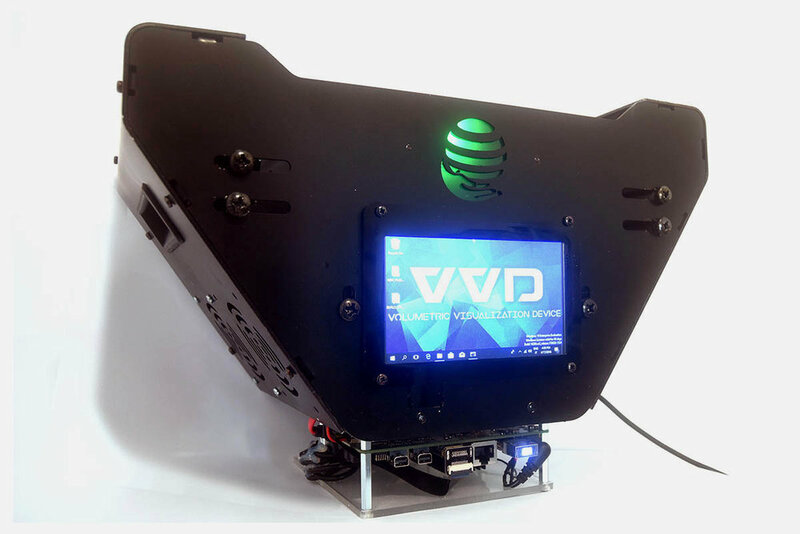 VVD: Volumetric Visualization Device is a patent pending solution invented by Lumi Industries, that allows a real three-dimensional visualization of 3D surfaces. Loading a simple Stl file, it is possible to visualize it in 3 dimensions as if it was an hologram. So that you can study its shape, volume and proportions, which often we cannot really catch when we watch a model on a flat bi-dimensional screen. Press Release Media files available here: part1 and part2.